Build a deck from over 1800 cards and take to the battlefield. It’s been four and a half years since Hex’s triumphant arrival on Kickstarter. Since then, we’ve come a long way, but today marks one of our biggest milestones ever — Hex: Card Clash will be launching on PS4! Hex: Card Clash is a trading card game with over 1800 playable cards, weekly cash tournaments, and unique ways to play that would never be possible in in a traditional card game. Battle against your friends and other players from around the world. Jump straight into the action in our new Dueling Pit, where you’ll use one of five different premade decks to play against either AI or player opponents. Once you find a deck you love, we’ll give you a copy to keep! Then you can take it into our deck builder to customize however you want. Aside from the thousands of cards available, you can also tailor your deck by choosing a champion with a unique ability or by strategically upgrading your socketed cards with your choice of over twenty different gems, which each modify your cards in cool ways. Battle on our competitive Ladder to earn prizes and climb from our Bronze Tier all the way to Cosmic. We have two separate ladders to climb; you can either play with your own constructed deck, play in our on-demand drafts and sealed events, or do both and get double the Ladder rewards! If you make it to Cosmic Tier, you’ll battle the best-of-the-best and vie for a spot in our $5000 Cosmic Crown Showdown at the end of the season. Do you have what it takes to be a star? Can’t wait for the next Showdown? 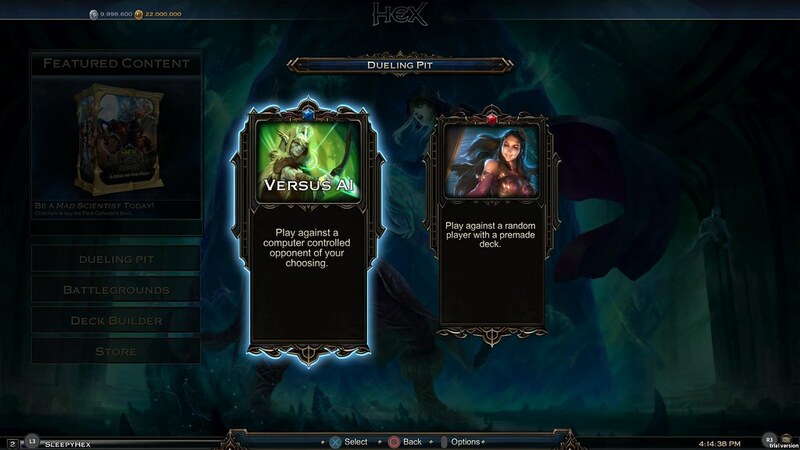 Every weekend, Hex holds two $1000 cash prize tournaments for you to compete in. In the Hex Bash, you’ll bring your own deck, while in the Hex Clash, you will have a limited pool of cards to build from. Win or lose, you get to keep the cards to add to your collection! Hex is ever evolving. We continue to release new cards every few months, which means our gameplay is always fresh and there are always exciting new strategies to pursue. We are thrilled to take this next step onto PS4 and share Hex with all of you. I absolutely love card games and was extremely disappointed when Magic the Gathering stopped bringing their games to PlayStation. This game looks very interesting and I’m already looking forward to playing it. It great to see that there is already a large variety of cards to use and I really like the Draft idea in a online card game. Thanks for coming to PlayStation! I haven’t looked up any info yet but I was just wondering if there was any 2v2 modes? Those are always hectic and crazy but that just makes it more interesting imo. 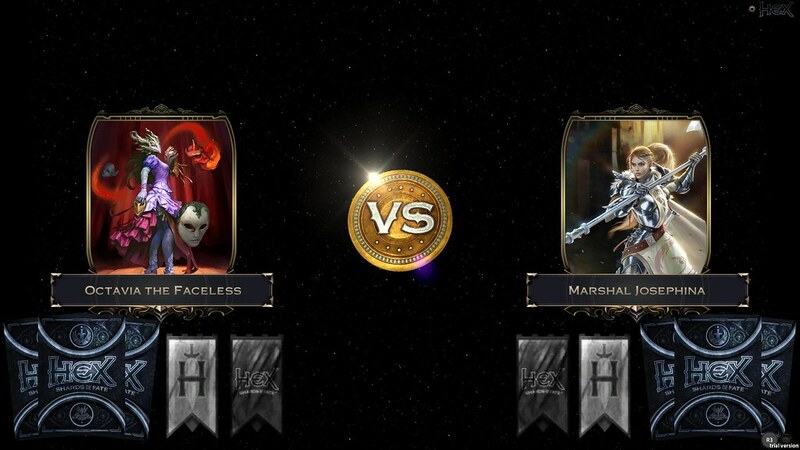 @Dethfuse, currently there are no 2v2 modes, but one day we should see something along those lines. Hopefully it will be coming sooner or later, since multiplayer modes were mentioned in the original kickstarter (Xv1 Raids, etc.) as a possibility in the future. One thing that’s very unique to Hex that has been an extremely popular game mode for them is what they call ‘Evolving Sealed’… it’s a best of one tournament where you start with a fairly small pool of cards to build a deck out of(you open 2 normal packs and also get a random selection of common/uncommon cards to bolster the pool) and as you win you get to open more packs for your pool, allowing you to adjust your deck. It’s my personal favourite limited tournament, just simply due to the multiple deckbuilding opportunities. Moreover, it was just twittered that with a PS+ subscription, you receive a free evo gauntlet ticket per week! As you keep all the cards, that is real value! Kind of. There is no up front cost involved in accessing the game, but tournaments/card packs cost money to purchase. It sounds like the duelist pit will be free to play as well, but that hasn’t been officially stated… and playing in the ladder on constructed is 100% free, although getting a deck good enough to compete may cost you some, similar to other tcgs like magic. I’m disappointed that the PVE campaign isn’t porting over. While it’s very likely it’s not, it hasn’t been 100% confirmed yet that there is, in fact, no PVE in this. Also, while this is just my own speculation, I’d imagine they would bring it into the game at a later date, perhaps as part of a semi-regular update, akin to free DLC. Hmm never heard of this game, but it will be nice to finally have what looks like a good card game to play. Gwent and several other card games have been available on the PS4. If you have a phone, you have access to every popular card game. Almost every modern citizen has had access to good card games for a while. This game is far superior to the run-of-the mill CCG’s like Gwent and others. First, it is a real TCG with emphasis on the “T”. Trading is a big thing and cards have real-world value. They can be sold for cash easily! Second, it expands on Magic’s very complex mechanics with even more mechanics that are possible only in a digital-only environment. Examples of this are drawing cards from your opponent decks, mixing your card in opponent decks, buffing cards in your deck with the prophecy mechanic. And then there is an ingenious new mechanism called Fateweave which lets you put either a random resource or a non-resource on top of your deck when you play a card with that keyword. Manaweaving made real. That is why it is truly Magic TCG 2.0. I hope people put some thought and creativity in to their decks. There’s nothing more boring than constantly playing against the same decks that were copy and pasted off the net. Hex has an public API and fanpages converting the output to a readable format ( https://hexpvptools.net/ ). This is why everyone is aware of what everyone else plays in Constructed. On one hand this leads to some netdecking but on the other hand, that makes it possible to counter “popular” decks with a specific anti-deck. However, in Limited, there is no netdecking as your cardpool is different every time – dependent on what is in the packs you open. This looks interesting! I’ve been waiting for a good card game on PS4. Back in 2011, I got Magic: Duels of the Planeswalkers for free with Plus, and I got hooked. I then bought the 2012, 2013, and 2014 versions. Sadly, we’ve not gotten any of these kinds of games for the last 4 years. PlayStation says the game is available now but I can’t seem to find it in the store or download it? Anyone else having that issue? 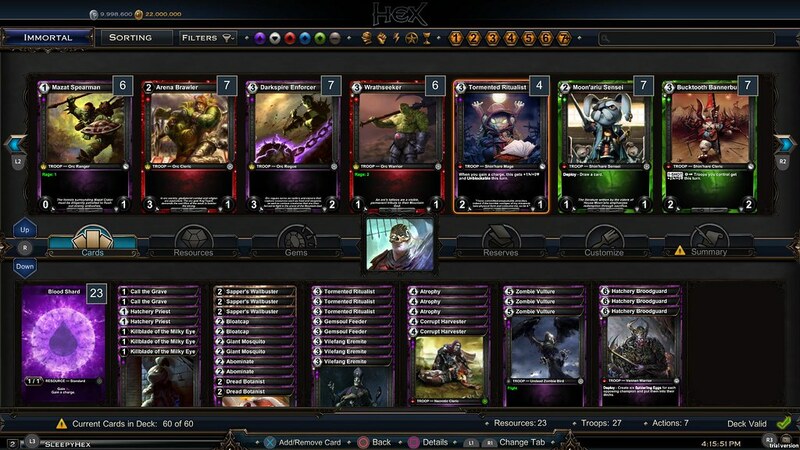 Hex card gave a very powerful stroke to the gaming in PS4. it is unbelievable.thew gaming is really too good with PS4. Look it up, they say there is a delay and that it might take a week. Not mad,it is better giving a good game then a glitch one.